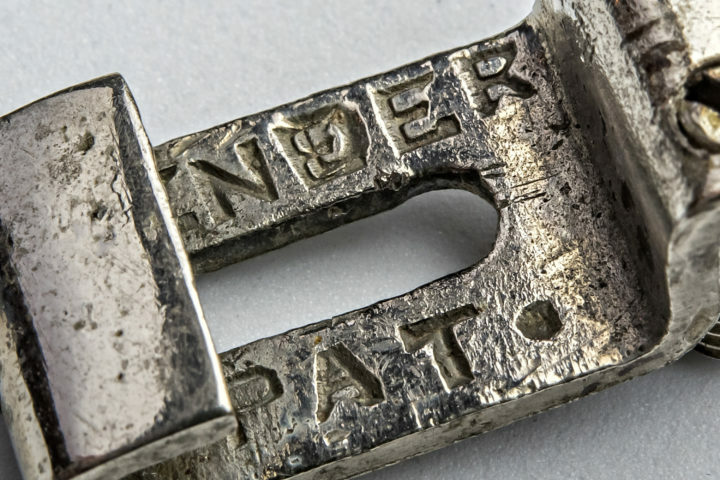 I first heard about the luthier Julian Chevens from Shane Speal, the Big Kahuna over at Cigarboxnation.com, the online gathering place for the cigar box building community. 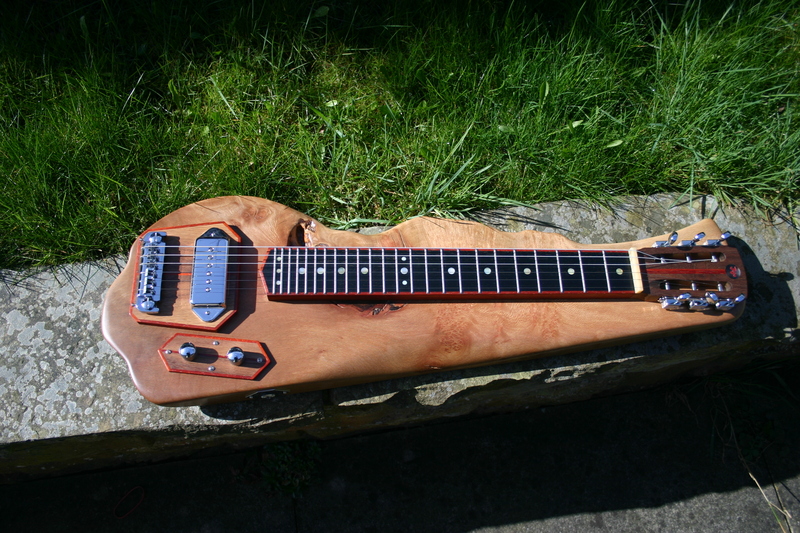 Speal sent me a photo of a beautiful lap steel that looked like it was grown rather than constructed. 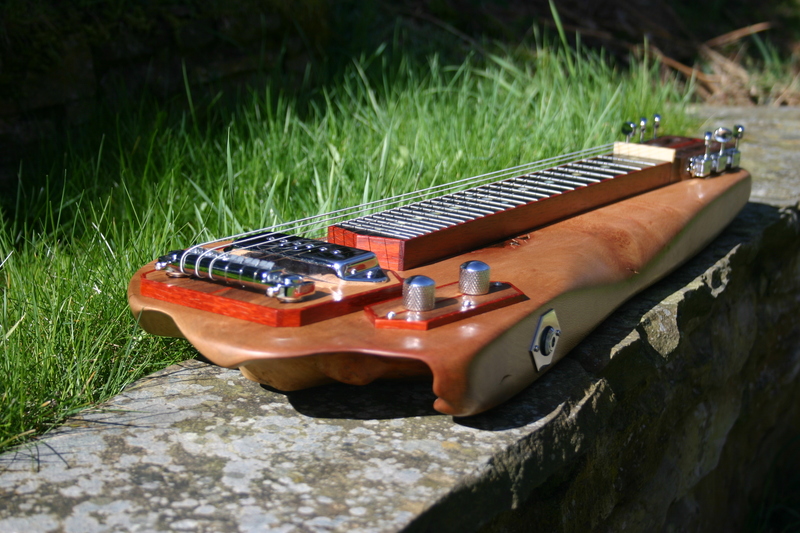 I was so impressed with the design, I got in touch with Chevens, who lives in Chapeltown in Yorkshire, Great Britain, and was surprised to discover that he had started building cigar box guitars only 18 months ago and that the lovely steel guitar that caught my eye was the first that he had made. Fretboard Journal: So, what is your steel guitar made from? Julian Chevens: The main body is lacewood, which is sometimes known as London plane. It was cut from the tree with that shape and it has a couple of small burls in it. 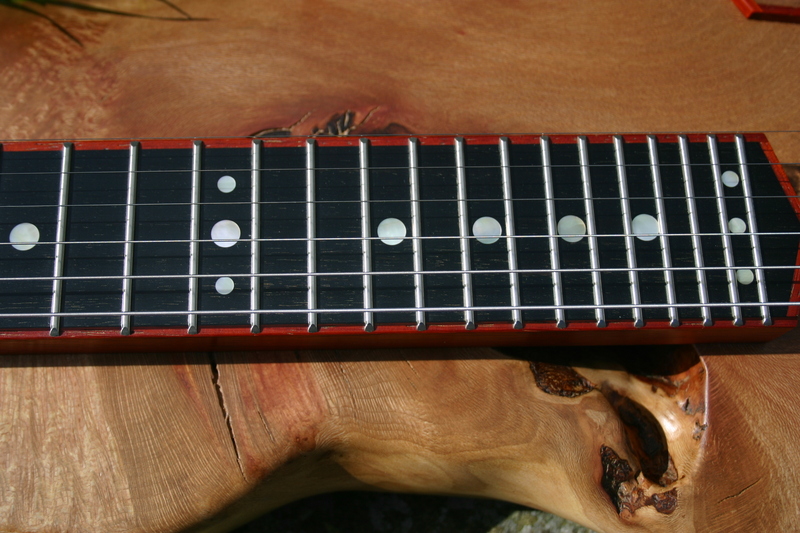 The fretboard is ebony that’s bound with African padauk. FJ: About how long did it take you to make this guitar? JC: I spent I’d say roughly about 150 hours. See, I don’t have a lot of machinery. Most of the tools I have are hand tools, and most of the work is actually been done by hand. So obviously it takes a lot longer than it would machine-wise. I think you can get a lot better finish doing stuff by hand than machines, to be honest. I used an Artec Alnico P-90 in this one because I liked the look of the shiny cover. Usually I make my own pickups. 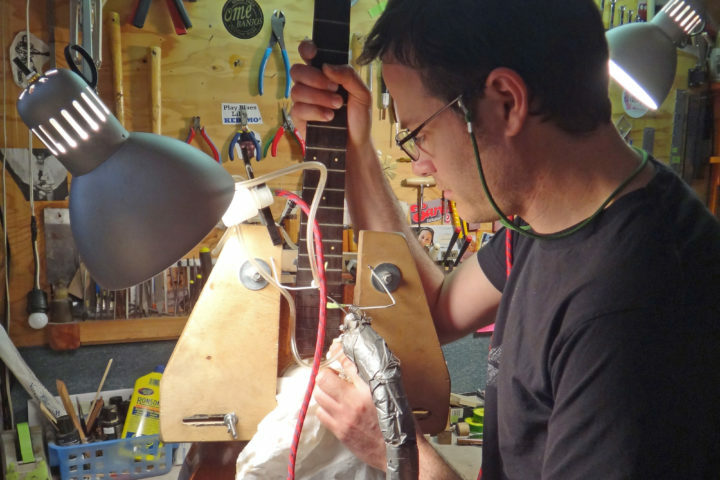 FJ: Are you a full-time luthier or is this a hobby? JC: I’m actually a joiner by trade, a carpenter, and cabinetmaker, but at the moment there’s not a lot of work on in England, you know, with the economic crisis. And I’ve started building cigar box guitars probably two years hence, just as a hobby on weekends. And then as work dropped off in my everyday work I’ve just started making more and more guitars and really got into it now. So basically I’m just making guitars all the time now. I’ve sold nine instruments since I started. FJ: Are you a guitarist yourself? JC: I like to think I am, but I’m not that good, like. I can get by. I can entertain myself. But I wouldn’t go up on stage and actually try and play. There’s a few tunes I’ve got on my page on the www.cigarboxnation.com site that I’ve actually recorded on the guitars I’ve made. So basically they’re these sound samples on an actual instrument, because obviously an instrument will sell better if you can give the person a sound demonstration. FJ: About how long did it take you to make this steel guitar? JC: I’ve spent I’d say roughly about 150 hours. See, I don’t have a lot of machinery. Most of the tools I have are hand tools, and most of the work is actually been done by hand. So obviously it takes a lot longer than it would machine-wise. I think you can get a lot better finish doing stuff by hand than machines, to be honest. FJ: And you made you own steel bar as well? JC: To be honest, I made that one because I’d been looking around to buy a steel for the guitar, and I just thought, “Well, for what they charge, you know, I’m going to have a go at making one myself.” I had some scrap brass laying about, so I wanted to try and have a go at making one, and it turned out good. I actually had a couple of steel players off of the forum asked me if I’ve copied it off of one, which I didn’t. I just did it out of me head. I mean, I’ve seen pictures of them so I know what steels look like, so, I just made one. FJ: It looks like you’ve made pickup covers for your other guitars? JC: Yeah, I make covers from wood and I wind pickups as well. FJ: Wow! So it’s like a full-service business there. JC: Well, I try to do as much as possible. The only reason I didn’t make a pickup for this lap steel is because I wanted to keep everything with a chromed look to it, otherwise I would have made the pickup myself. FJ: So about how many guitars have you made so far? JC: Including the lap steel, that will be 20 all together. 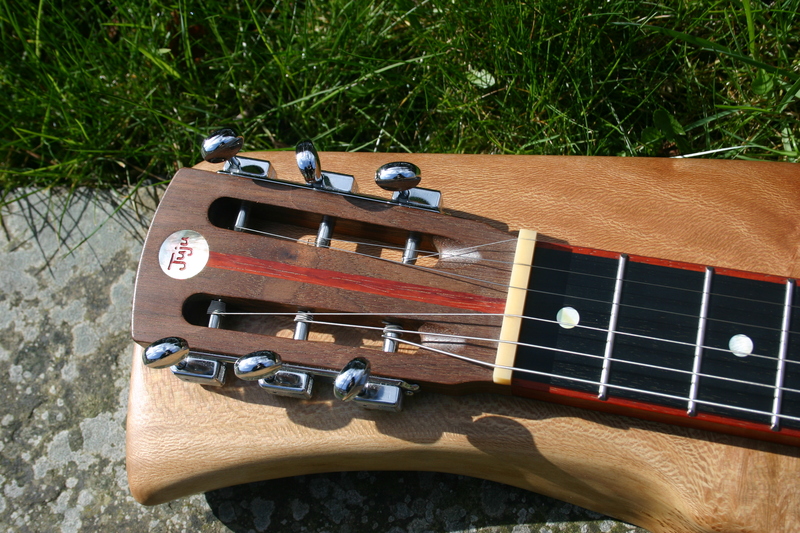 FJ: What amazed me about the lap steel is that the work is so clean and tight. You know, the kinds of things that you see in the bindings and the purflings—everything seems to be so nicely mitered. And those are the kinds of things that builders who are just getting started, it takes a while to master, but you seem to have it right off the bat. JC: Yeah, well, like I say, I’ve been a cabinetmaker for 12 years. So, really, if I don’t do a good job at work I don’t get paid. So you soon learn to do good work. As I said earlier, all my work is done by hand. It’s not machine-cut. I fancy scrapers and traditional woodworking tools like that, carpenter tools as opposed to machines. 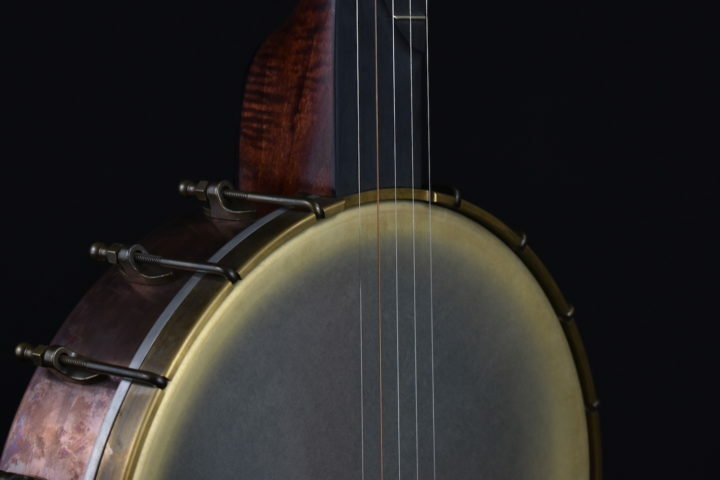 I think it adds to the overall feel and look of the instrument when it’s all been done by hand, to be honest. FJ: And have you made any sort of standard style guitars? Or are they all kind of in the cigar box tradition or steel guitars? JC: Not as yet, but I’m working towards that. I’ve always fancied making myself a Les Paul, and maybe some Telecasters. I want to try and get into them sometime this year. But at the moment I’ve been winding that many pickups for people. I’ve got 30 pickups to make since the beginning of the year. And possibly I might have got an order with a guy in Switzerland, who owns a big music store, to take some Telecaster hand-wound pickups.